One of my husband’s favorite fish choices is cod. He is English and used to have it at home a lot. Normally, I just bake the cod with Panko bread crumbs. My friend Regina, from Molly Mell, submitted this recipe for me to feature. It is a baked dish with loads of flavor. Regina submits Brazilian recipes for me often. I love trying out international cuisine and her dishes are just full of flavor. Regina makes a home made tomato sauce for the codfish casserole with Campari tomatoes. Colorful sweet peppers, onions and black olives complete the topping. Serve with rice for a satisfying and hearty fish dinner that your family will love. 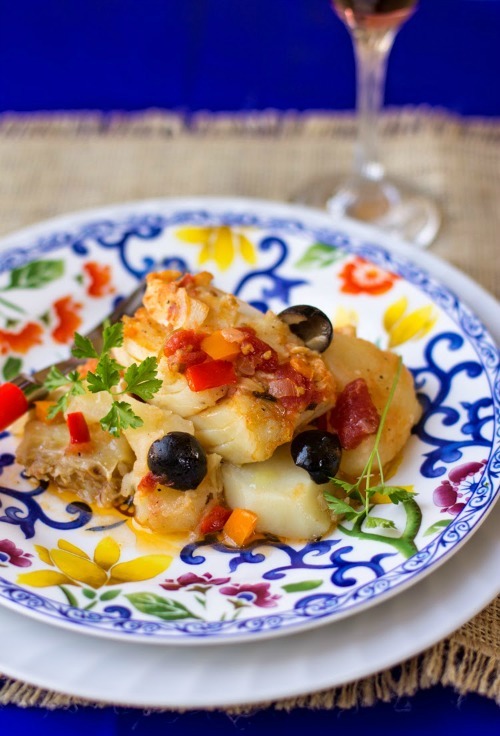 The colors in the codfish casserole dish are as appealing as the taste itself! You can visit Molly Mell for more details on how to prepare this great tasting recipe. 2-3 tbsp olive oil plus extra for the baking dish. Just before you are about to start cooking bring the fish to a quick boil, drain well and pat it dry. Cut the fillet into chunks about 2 inch square.Taste for saltiness and set the fish aside. Place about 2-3 tablespoons of extra-virgin olive oil in a saucepan, add diced-cut onions and let them start to glisten and sweat a little before adding garlic, stirring constantly. Add the peppers, parsley, freshly ground black pepper and pitted black olives. Peel and slice the potatoes into ¼ inch thick chunks and cook them just tender but not fully cooked. Generously coat the bottom of a large baking dish with a bit more extra-virgin olive oil. Place a layer of potatoes, and a layer of the tomato sauce over it. Add the cod fish fillet pieces and generously pour some extra-virgin olive oil over it. 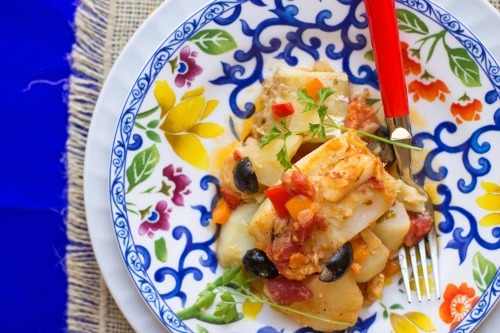 Repeat with another layer of potatoes, tomato sauce, fish and olive oil. Preheat oven to 350°F and cook uncovered for about 30 minutes, or until you see the fish has started to flake. Recipe submitted by Regina from Molly Mell. Want your recipe featured on my site? Please email me with details.